Our 200 hours Yoga Teacher Training Courseis conducted several times a year at Doi Saket Yoga Center and also in Brazil and Bali, Indonesia. 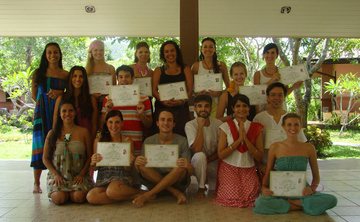 We also conductAdvanced 300 & 500 hours Teacher Training Courses at Doit Saket Yoga Center. Contact us for more information onlong term programswhich involves training on the therapeutic aspects of Yoga and are based on self-study & experiencing life in an Ashram environmentin the spirit of Karma Yoga. Please visit ourHome Pagefor more information about the 200 hours courses and make your online registration through theBooking Page. If you have any questions dont hesitate to contact us.We are looking forward to have you staying with us!